More staging? Don't I have enough staging tracks already? Well, yeah, kinda. I have 4 staging tracks at the moment, 170-200cm in length. That is a lot longer than my longest passing tracks which is 120cm in Emsingen, so when I operate I often end up doubling up two of the shorter trains in the longer staging tracks. ... And then the schedule asks for the rear train to show up first. There are ways around that (e.g. shuffling trains to another staging track, or releasing the first train to the ramp, and then use the down ramp track to bring the second train up... yes, there are a lot of switches in staging...) but those operations are not fun to do, and the risk of derailments is high. I call the existing staging yard Staging 1. Additionally, as I digitize more locomotives, I need more space for active trains. To provide more storage capacity and expand staging capacity, I decided to stick a few more staging tracks below Moebelfabrik Kopper along one wall of the room. 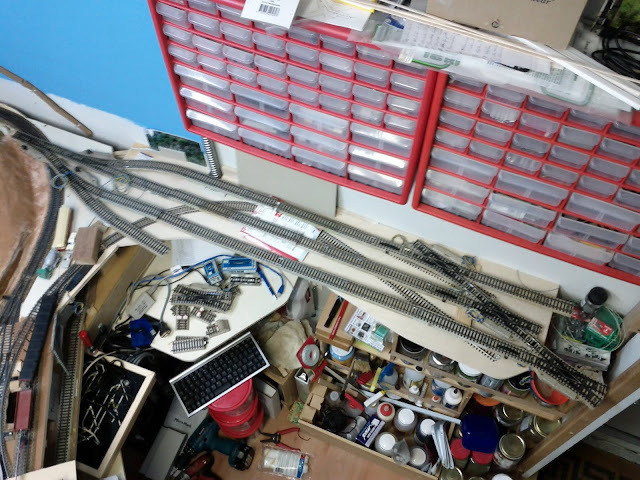 The shelf for Staging 2 is not yet built, so I tested the track arrangement by simply laying out the tracks on top of the future of home of Moebelfabrik Kopper. I was able to cut an additional switch for accessing Staging 2 in the existing trackage behind the last switch of Staging 1 without modifying the existing geometry of the departure track. Originally I planned a trapezoid switch arrangement for Staging 2 giving me 120 cm usable length for each staging track. Due to how the departure track curves and underground supports, I gave up on that approach and ended up with above arrangement. I'm mostly using M-track switches from my Dad's layout. Each staging track will have a usable length of 130cm. The switch ladder made from double-slip switches allows locomotives to move around the train. The rear track is 77cm between switches, the middle track 90cm, and the front track 117cm. This is sufficient for most passenger locals I'm plannung to run. The full 130cm are available for longer trains, but those need more involved maneuvers to swap the locomotive to the other end of the train. A stub track can be attached to the last switch in the lower right of the picture. That track will stick through the door and will need to be removable. It might be possible to build a removable return loop from that last switch out into the garage and conecting to the middle track through a hole in the wall. There is a short stub track off the switches on the layout side to arrange for locomotive changes without running around the cars of an arrived train.